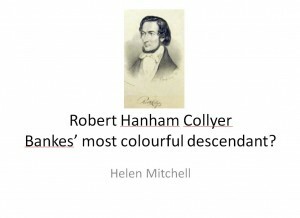 This page contains the text of the slides that were used by Helen Mitchell in presenting her talk at the Bankes Descendants’ Reunion at Coulsdon on 18th June 2011. Some content has been added to improve the flow of the narrative. 20. Robert Hanham Collyer – What was he Like? Son of Robert Mitchell Collyer, grocer & Ann Elizabeth Dujardin, resident in St Helier. Formerly of London. His research results in the publication of Manual of Phrenology published in 1838. He sells copies at talks, with personalised readings pasted inside. In 1838-9 he continues touring and speaking on phrenology. RHC still lectures on phrenology – he’d simply expanded his range of talks! It does not make him popular! In September 1847 Collyer arrives back in New York, accompanied by his father and a cousin, with a bang! Others have a different opinion! They then tour New Orleans, Cincinnati, Alabama, and other locations, before returning to New York. At the end of 1848 Collyer starts advertising talks in New York giving people practical advice on identifying and washing gold – apparently he is an expert on this thanks to being a Professor of Chemistry! The following April he departs for California as part of the ‘Fremont Association’ party, accompanied by Mrs Collyer and Frederick, his ‘brother’. He is accused of not helping with cooking, of trying to swindle the group over a case of medical instruments, and it is said there is an ‘unenviable notoriety’ surrounding him. Members of the group suspect his wife may not be his wife and his brother may not be his brother – or even male! But – he is ousted as chairman by a certain Mr Smith, who takes Collyer’s place in the procession for the distribution of prizes. Collyer tries to take back his place in the procession and a scuffle ensues, ending with him being held back by a policeman! In 1855, while in Suffolk (presumably while visiting the manufacturers of his gold crushing machine) he becomes interested in a coprolite pit where an interesting jawbone had been found. Extracting teeth from his mesmerised subjects on stage was a key part of his act! By 1871 the family were back in London, though in 1872 Collyer visited Moscow for an exhibition. They stayed in London until around 1878/9. The earliest mention we have found of a ‘Mrs Collyer’ is in 1838 at Louisville, Kentucky, USA, where he caught her in bed with Captain Marryat (of Children of the New Forest fame), causing a scandal. A duel was averted. 1863 – A daughter, Dulcybella, is baptised in London – mother’s name given as Mary Ann. 1873 – RHC’s Marriage to Emily Jeans Clements is annulled when she finds out his first wife was still alive! After the annullment the children stay with their mother and some members of the family later emigrate to Canada. 1876 – Has been living with a certain Mrs Sigismund for some time, and she has taken his name. Her husband files for divorce. How many more women were associated with RHC? Who knows! Robert hanham Collyer died – according to a statement by his sisters – around the year 1890 in the New Orleans area. The exact date and location is unknown. 20. What was Collyer like? The image at the top of this page is a lithograph of a young Robert Hanham Collyer, and is reproduced on this website by courtesy of the American Antiquarian Society, Worcester, MA, USA.